I first came to France on my honeymoon – Paris, not very original, but it was the start of a life long love of the country. I was 23 years old. Over the years, I am now 50, I travelled to France many, many times and read her history and dreamed of settling down one day in a cottage with a garden. By a twist of fate [see previous posts], I found myself in France quicker than I expected and this year in March, moved permanently. Lack of money, but tonnes of enthusiasm and the practicality that this is now home and no return to the UK, I started exploring blogs on France to learn about life here, get inspired and hopefully make contact with other Francophiles and to try and find a method of making some income. My long term career choice is to write, photograph and craft, to finish the numerous children’s books I have started to draft and blog about trying to live self-sufficient here. Next year I hope my camera will be firing away more than this year and I can find my photo-feet in the process. But one great start has been finding Janine Marsh and her blog The Good Life France. This online magazine is best described by Janine herself [read below], and is well worth subscribing too. I wrote my first article for this magazine on Renovating A Barn and was thrilled to be able to do so. I am due to write an article on one of my huge passions – cheese and currently deciding which ones to choose out of the many hundred they have in France. Of course I will need to taste test before committing to print – all part of the research process! Bonjour and a great big bienvenue to all new subscribers – it’s great to meet you. 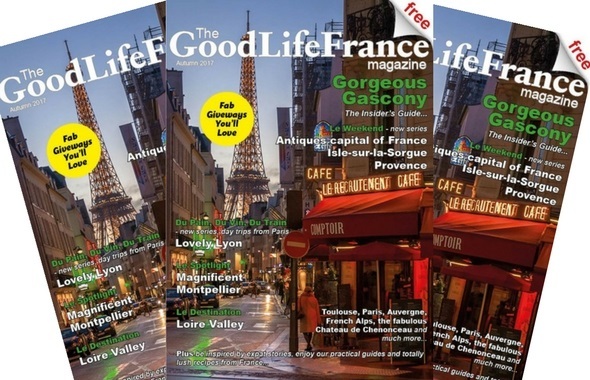 This week I’m thrilled to share with you the Autumn issue of The Good Life France Magazine. It’s my passion to put this together and to share it with you. It’s completely free to read online and to download a PDF to read at your leisure and it’s always going to be free. Don’t let the fact that I’m not charging you for it fool you into thinking it’s not worth a read cos that’s just not the case. Give it a go and see for yourself, it’s created and written by professionals and in the last year or so, almost 20,000 people have subscribed to this magazine (for free of course) and I can’t tell you how thrilling that is to know that people are really enjoying it. I don’t have a budget to promote the magazine, the growth is from people sharing it with their friends and if you like it, please feel free to share it too. I produce it because I love writing about the places I visit and about life in France and sometimes it’s great to write pieces that are longer than website pieces so you can have all the details in one go and lots of gorgeous photos. In this edition there are two new series, first, Le Weekend, starting with intoxicating little Isle sur la Sorgue, the antiques capital of Provence. The second series is Du Pain, Du Vin, Du Train – day trips from Paris. There’s also an insider’s guide to gorgeous Gascony, 5 fabulous Chateaux in the Loire Valley including Chenonceau where I had a lesson with the legendary florist (I wasn’t very good at it but the photos are wonderful!). You’ll discover sunny Montpellier, 10 reasons to visit Paris in the autumn, a long-lost love cheese in the Auvergne (it’s a great story), plus a whole lot more. There are lush recipes, useful guides, expat stories and fab giveaways… and that’s not all. Yes, Janine Marsh certainly has a great publication in ‘The Good Life’ … I’ve subscribed since I moved here and I don’t think I know a single Franglais blogger who doesn’t. I’ll be interested in your Cheese article, of course …. Had a wander round one of the local cheese stalls and picked up a couple of cheeses – one goat, one cow and hoping sunshine tomorrow so I can get the photos taken. Once that’s done I can get round to the best bit – eating them! Slightly envious that you made it permanent! One day, oh one day it may be me ! …. Hi, it was a dream I didn’t think would materialize so soon. Just shows you can’t always control destiny. But a long term plan helps when events speed up.